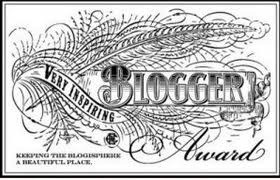 This is the first time I have been nominated for any type of blog award, so I find it a real honor and wish to thank http://thejennymacbookblog.wordpress.com for that. I have only been blogging on WordPress for barely five months now. I have already had over 1000 views and just as many followers. I would truly like to thank each one of you that reads my blog. And a HUGE thank you to those that do/did click on the follow button or the RSS button and comes back to re-read my blogs. I know sometimes my blog may not read like I’m a professional blogger, I’m not…yet. 😉 I’m just getting started in the blogging world. I love to write and share stories. I do hope that you all enjoy reading my blogs as I enjoy sharing them with you. This entry was posted in Awards, Blog and tagged authors, bloggers, blogging awards, inspirational bloggers, professional bloggers, writer's, writing on November 14, 2012 by JenniferNAdams.